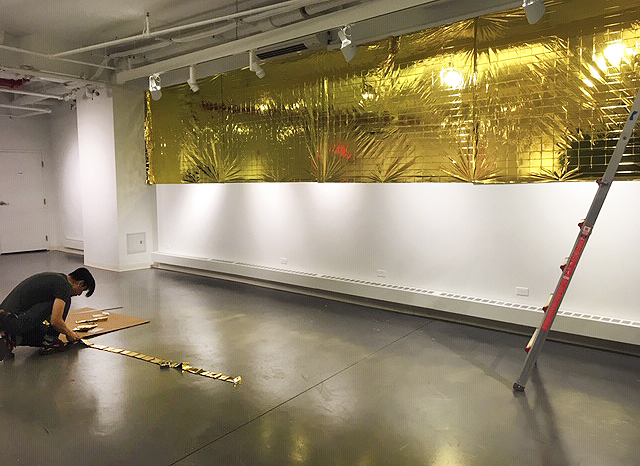 Mauricio Esquival installing for Material with Meaning. Opening Reception, February 8th, 6 - 9 PM. Bronx River Art Center (BRAC) is proud to present Material With Meaning, featuring four emerging and mid-career New York artists whose international roots include Nigeria, Mexico, El Salvador, and China. This exhibit, showing from February 8 - March 16, 2019, continues BRAC's longstanding commitment to cultural diversity paired with artistic excellence. For artists, their choice of materials is singular: the material was necessary to create the work and to communicate its message. Within the wide embrace of multi-media, artists are not reluctant to display their respect for the constituent elements of their work. In doing so, they also proclaim their identity as craftswo/men and bring art-making to street level, where it can be appreciated by the widest possible audience. Join us in BRAC's newly restored storefront, white box, gallery, in the heart of the Bronx, for this presentation of contemporary art that imbues the material installations with deep rooted meanings.